Staring into the huge hole in the road, this Chinese official probably cannot believe his eyes. That's because a lorry has fallen down this massive fracture in the road which opened up as he drove over it. The drama unfolded in the city of Changchun, which is the capital of north eastern China's Jilin province, earlier today. 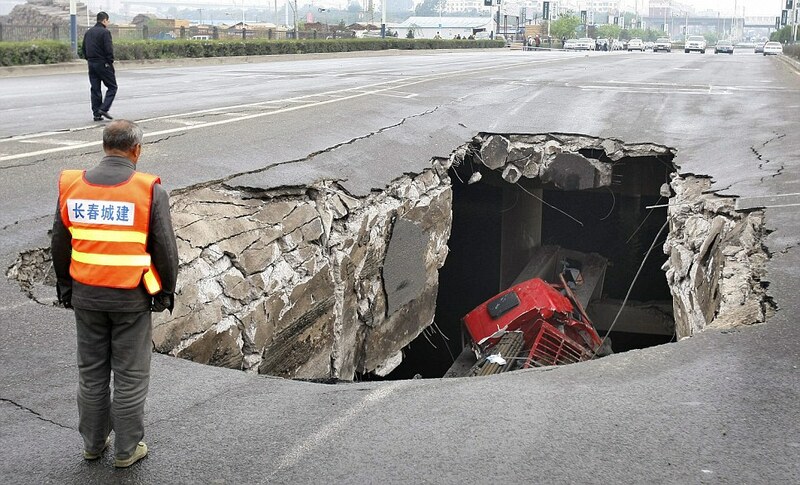 A Chinese official stares into the hole the lorry created when it fell through a fracture in the road as it drove over it in the city of Changchun. The two men who were inside the cab at the time of the accident were both injured, but there were no reports of how badly. Authorities are now investigating the accident but they suspect the truck, which was carrying steel pipes, was overweighted. The accident is just one of hundreds that take place in China each year, with the country being one of the most dangerous places in the world to drive. There are around 100,000 deaths a year caused as a result of traffic accidents, which is twice the number of the United States, despite the fact the U.S. has four times as many cars. The roads are also notorious for poor building standards. In February four lorry drivers were lucky to survive after a bridge collapsed as they drove over it in Shangyu, in east China's Zhejiang Province.